The thermocouple is a thermometer for measuring high temperatures that consists of an electrical circuit created by connecting two wires of different metals. It utilizes the voltage (thermoelectromotive force) created when there is a difference in temperature between the junction and base, calculating temperature from the strength of the voltage. Platinum thermocouples can be used in an oxidizing atmosphere of 1,000°C or greater and are optimal for temperature control during steel, semiconductor and glass manufacture. 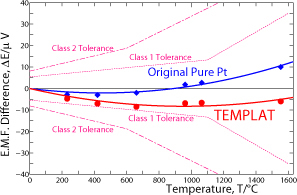 As the negative electrode of pure platinum used in type R thermocouples has the disadvantage of easily fracturing at high temperatures, zirconium oxide was dispersed in platinum for the first time in the world, which creep strength of negative electrode at high temperature by ten-time of conventional ones. 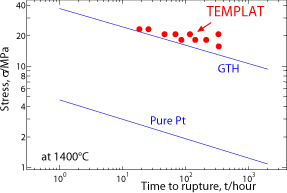 When compared with high purity platinum or the conventional oxide-dispersion-strengthened material (GTH), TEMPLAT has fracture stress up to ten times better than pure platinum even with the same fracture time. 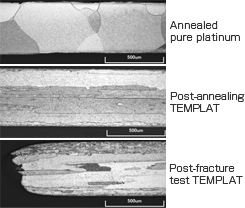 Comparison of sectional structure also reveals that TEMPLAT metal structure does not exhibit changes even after creep testing and has no bamboo structures, which are the main cause of wire breakage. When crystal grains coarsen in thin wire and the grain boundary comes to cross the entire wire diameter, this state is called a "bamboo structure" because the grain boundary appears just like a bamboo joint. This exhibits the same thermoelectromotive characteristics as the negative electrode of pure platinum currently in use, and can therefore be replaced conventional lines. * The standard wire diameter is φ0.5, with class 2 precision. 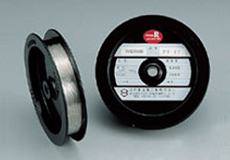 If you would like a different wire diameter or class 1 materials, please inquire separately.